Jed Watson took four titles at the final West Country nursery trial. Held at Trethern, Delabole, the mainly flat course with a fetch of more than 350 yards was gathered equally well either way. Worked in fives, the mixed hoggs ran well if given room and handled quietly. However, once upset they were unforgiving. Bob Watson judged the running seeing 11 entries go to the post in the Maltese cross class. At five, John Carter and Joe set the standard gaining 66 points. At seven, Jed went ahead with Spot, registered Spud (R. Jones’ Nell, D.K. Evans’ Spot). The big smooth coated dog had a faultless outrun and lift. For minor line deviations over the fetch he lost three points. If given time to look the sheep were not too bad to put through the Maltese cross and often went through easier the second time. However, Spot lost just two points the first time but as one sheep played up he dropped six points the second time. At the shed he took two sheep and held them well but lost three points for not taking an earlier opportunity. One sheep went up the side of the pen and then they fidgeted in the mouth costing three points before going in. Spot’s score of 73 gave him a clear lead and his ninth Maltese cross win. Consequently he won the trophy for the Maltese cross aggregate. Jed bought him almost by accident. The dog had been with someone on trial and it had not worked out therefore Jed had picked him up to return him to his owner. Jed tried Spot and rather liked him, therefore, he bought him and he is rather pleased that he did. In the driving class of 13 entries competition was much closer. At eight, Jim Nicholls took the lead with Rob. Nine marks were deducted from Rob’s out-bye work, four for stopping short, two at the lift and three for line down the fetch. Over the right-hand drive he lost 14 points. These were lost mainly for missing the cross drive obstacle, which caught most competitors out and having a wide turn into the return. After a good shed where one point was lost, three went at the pen, giving a score of 83. Jed ran Huthwaite Roy (S. Wilkinson’s Huthwaite Holly and Joss) at 11. Jed stopped Roy short, then had to move him on losing two points from his right-hand gather. Two points were lost from his lift and for minor deviations four went from his fetch. After keeping a good line over the first leg of the drive and having a tight turn, the sheep increase their pace over the cross drive as they headed towards a gateway. Jed held Roy back to try to steady them. At the last minute they drifted off line and missed the last obstacle. Ten points were deducted from Roy’s driving. Just one point was lost at the shed and one sheep going around the pen several times cost six points at the pen. Nevertheless, scoring 85, Roy, who was the runner up at the English nursery finals, took the title. With eight wins, his kennel mate Jill, who won the Maltese cross aggregate last year, won the driving aggregate. Carol Worgan won the ladies driving aggregate with Lee and the ladies Maltese cross aggregate with Layla. From the entry of five, Will Carter, John Carter’s grandson, won the young handler class with Sanduck Queen. They gained 74 points which was the highest score achieved that day on the Maltese cross course. Mary Ridge won the young handler aggregate trophy with Mac. Sarah Shuffle with Floss won the new handler class, while runners up Lee Ireland and Ned won the new handler aggregate. At the open trial held at Holmrook, host Arthur Temple judged the entry of 38. Running was over a good sized course which had a deep dip in the middle and lengthy sections of driving. If handled with respect the Mule and Texel cross hoggs ran well and enabled a high standard of competitive work. When Tom Huddleston ran Nessy at number 30 the judge thought his run would not be beaten. Nessy lost just one point from her fetch and one from her driving to score 88. However, at 35, with a near perfect trial Katy Cropper and Zac (E. Gray’s Cwmadog Beth, P. Bristow’s Bill) took the title. Losing just one single point from their cross drive gave the winning score of 89. At 13, Alec Baines and Tanhill Sue took the lead in the novice class gaining 83 points. The winning run came at 20 when Peter Ellis ran George (P. Ellis’ Bell, A. Temple’s Jack) the North Westmorland nursery champion. Losing an odd point from his lift and four over his driving George won the novice class on 85. WEST COUNTRY Nursery, Trethern, Delabole, Cornwall, (Judge, B. Watson, North Tawton) Maltese cross (11 ran) 1, J. Watson (Postbridge) Spot, 73 of 90; 2, J. Carter (Delabole) Joe, 66; 3, J. Holdsworth (Moretonhampstead) Heidi, 64; 4, J. Nicholls (Buckland Brewer) Sam, 61. Maltese cross aggregate trophy J. Watson, Spot. Ladies Maltese cross aggregate trophy C. Worgan (Chulmleigh) Layla. Driving (13 ran) 1, J. Watson, Huthwaite Roy, 85 of 110; 2, J. Nicholls, Rob, 83; 3, M. Evans (Holsworthy) Ben, 82; 4, J. Nicholls, Jen, 80; 5, I. Mackay (Lustleigh) Sanduck Star, 75; 6, F. Richards (Saltash) Jill, 74. Driving aggregate J. Watson, Jill. Ladies Driving aggregate C. Worgan, Lee. Young handler (5 ran) 1, W. Carter (Delabole) Sanduck Queen, 74 of 90; 2, C. Fritsgerald (New Forest) Del, 66; 3, L. Hopper (Veryan) Fern, 62. Young Handler aggregate M. Ridge (Chulmleigh) Mac. New handler (2 ran) 1, S. Shuffle (Cornwall) Floss; 2, L. Ireland (Veryan) Ned. New handler aggregate L. Ireland, Ned. HOLMROOK, Cumbria, (Judge, A. Temple, Holmrook) Open (38 ran) 1, K. Cropper (Shap) Zac, 89 of 90; 2, T. Huddleston (Caton) Nessy, 88; 3, P. Ellis (New Hutton) Joe, 87; 4, A. Lehtio (Finland) Coel, 86 TIME; 5, S. Cropper (Deerplay) Beechwood Ben, 86; 6, A. Baines, Tanhill Jock, 85. Novice 1, P. Ellis, George, 85 of 90; 2, A. Baines, Tanhill Sue, 83; 3, T. Rome (Whitehaven) Nell, 83; 4, L. Cowper (Threlkeld) Flo, 81. April 23. LEE END, Open, Lee End Farm, Quernmore, Lancaster, LA2 9EE, 8.30am start, enter on field by 2pm. BODFARI, Session 1 (Judge, Bryn Davies) Open National, 1, S. Holt (Libanus) Roy, 7; 2, C. Rundle (Bodfari) Beka, 8; 3, A. Blackmore (Ledbury) Del, 10; 4, A. Davies (Bryneglwys) Peg, 12 OLF; 5, K. Evans (Libanus) Preseli Ci, 12; 6, A. Owen (Corwen) Roy, 16. Class two, 1, C. Rundle (Bodfari) Beka, 8; 2, L. Jones (Minsterley) Sian, 16 OLF; 3, A. Owen (Corwen) Roy, 16; 4, P. Willians (Treuddyn) Meg, 18. Session 2 (Kevin Evans) Open National, 1, N. Watkins (Llanddeusant) Tanhill Alex, 15 OLF; 2, K. Dodd (Malpas) Bill, 15; 3, G. Owen (Llanerchymedd) Moss, 18; 4, N. Watkins, Jody, 20; 5, S. Holt, Hybeck Blake, 21; 6, A. Owen, Roy, 22. Class Two, 1, A. Owen, Roy, 22; 2, A. Davies (Bryneglwys) Becca, 23; 3, P. Williams, Meg, 25; 4, A. Blackmore, Joe. BODFARI, (Gwynfor Owen) Open National, 1, A. Owen, Glesni, 11; 2, S. Holt, Roy, 12; 3. K. Broad (Llanllawddog) Kinloch Cade, 13; 4, A. von Dinther (Wirswall) Jake, 14; 5, J. Johansson (Denmark) Ztill, 15; 6, A. Williams (Penmachno) Max, 16. April 22. GADFA FUNDRAISER Open national, two sessions, enter on field, start 7.30am, catering, contact R. Owen, tel: 07979 199 768. April 28. GARNDOLBENMAEN A’R CYLCH Dolwgan Isaf, Local class, Classes 3 and 4. Start 4pm, entry on field, contact M. Griffiths, tel: 01766 530 834/ 07876 552 285. April 29. GARNDOLBENMAEN A’R CYLCH Open national and Class 2, two sessions, catering, start 8am, contact M. Griffiths, tel: 01766 530 834/ 07876 552 285. April 29. LLANGADOG AND DISTRICT Old Racecourse Fields (on A4069 towards Llangadog) two sessions, Open national, catering, start 7am, pre-entry, contact C. Price, tel: 07815 289 410/ 01550 740 506. Eye testing at trial, contact Claire Ridge, tel: 07773 192 283. May 1. CWMDU Bwlch, Open and Novice national, two sessions, catering, start 7.30am, contact C. Watkins, tel: 01874 711 609. May 3. 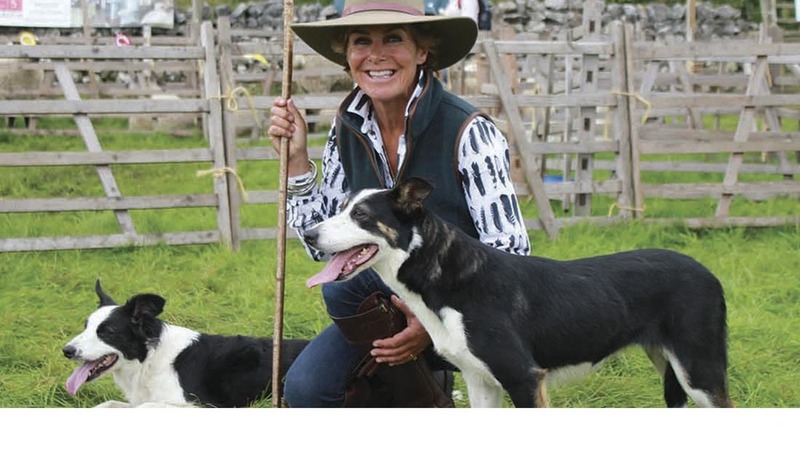 GLYNLLIFON Cynnog Road, Caernarfon, LL54 5DU, Open national and Class 2, two sessions, enter on field, young handler class, catering, start 9am, contact N. Lloyd Davies, tel: 01286 830 261. May 6. DYFFRYN NANTLLE VALE Talysarn, LL54 6AU, Open national, two sessions, pre-entry, young handler class, catering, start 8am, contact B. Griffith, tel; 01286 880 088. Eye testing at trial. May 6. ERWOOD LD2 3PX, Open and Novice national, two sessions, catering, start 7:30am, contact A. Rees, tel: 01982 560 336/ 07817 707 621. May 7. ERWOOD Local class, 14-mile radius, start 2pm.